Hospice Care, Comfort Care, and Palliative Care: If you are helping a loved one through the end-of-life process, chances are you’ve heard these terms before. It may seem doctors and caregivers use these terms almost interchangeably. But what do they actually mean? And how are they different? Understanding what each of them means will empower you to speak out about the precise level of care your loved one wants and needs. Put plainly, hospice care is for people in the dying process. Generally, a person must be considered to be terminal or within six months of death to be eligible for most hospice programs. Rather than focus on receiving treatment to cure an illness, these programs offer medical care that will maintain or improve the quality of life of the dying patient. Hospice care can be provided in a patient’s home, with physicians, nurses, and home-health aides visiting the patient on a regular basis. It can also be found in outpatient hospice, a skilled nursing facility, or assisted living facility. Aside from medical care, hospice also offers support for caregivers during the dying process, as well as grief support after the death of their loved one. 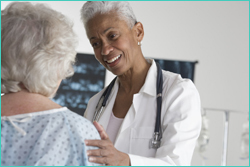 Comfort care is a term typically used in hospitals. If a doctor talks to a patient or loved one about putting the patient on comfort care, they are saying that, at this point they have nothing else they can do to cure the patient’s disease. The focus in medical care will shift from curing to caring. Although they will not be able to cure the patient, they will be able to keep them comfortable, relieve any of their pain, and help them have a dignified death. To palliate means to relieve, lessen, or alleviate. The main goal of palliative care is to help alleviate physical symptoms of pain. Unlike hospice care and comfort care, which are used explicitly for the dying, patients can receive palliative care at any time, at any stage of illness whether it be terminal or not. Comprehensive palliative care includes pain and symptom management, support for the family, and the opportunity to achieve meaningful closure to life. It’s important to note that when referring to a terminally ill patient, the term "comfort care" is often used synonymously with the term "palliative care." Understanding the nuances between these three terms will help you communicate with medical professionals and other caregivers throughout your loved one’s end-of-life process. If you are ever unsure about what exactly a doctor means, don’t be afraid to ask for clarification. Being on the same page with your loved one’s caregivers is a key step in ensuring a comfortable end of life. For additional information and links to other related resources, please visit End With Care’s end-of-life topic page on Hospice and Palliative Care.